(AKA Green Monkey, Insect, Invasion of the Bodysuckers) 1986, Starring Steve Railsback, Philip Akin, Susan Anspach, Cynthia Belliveau, Joy Coghill, Robin Duke, Joe Flaherty, Helen Hughes, Sarah Polley. Directed by William Fruet. 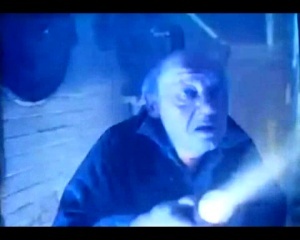 This Canadian horror movie was released under several titles, including Blue Monkey and Green Monkey. Watching it, you may be surprised to find a distinct lack of colourful monkeys, killer or otherwise. Instead, Blue Monkey is about a gigantic bug in an updated version of the nuclear mutation films from the 1950s, most notably the classic giant ant b-movie Them!. Don't get upset, because even if you were hoping for a fine slice of monkey movie magic, you still might like Blue Monkey. This film is a fun outing for Canadian director William Fruet, who succeeds not only by drawing a campy playfulness from his material, but also in scoring some brilliant casting. Underrated Second City comedian Don Lake, who recently appeared in both Waiting for Guffman and Best in Show has a significant role as a entomologist named Elliott, and one of my favourite Canadian actors, the stoic John Vernon (Caddyshack, Point Blank) appears as the hospital director. Smaller roles are filled by Helen Hunt (Incubus), a very young Sarah Polley (in a role she'd probably sooner forget) and ex-SCTV personalities Joe Flaherty and Robin Duke as The Bakers, a couple having a baby. While all these faces are familiar to Canadians, you may not know much about prolific Canadian director Bill Fruet. Born in Lethbridge, Alberta, Fruet acted in a couple of NFB films before going south to attend school at UCLA. There, he most likely met fellow Canadian Don Shebib in the film program, which was regularly tapped by Roger Corman looking for cheap labour. When Fruet returned to Canada after a stint of industrial films, he wrote the scripts for two of Shebib's best known films, Goin' Down The Road and Rip-Off. He also directed Wedding in White, which won awards for it's depiction of the Prairies in the 40s. In the mid-70s, Fruet changed direction, making a long string of Canuxploitation films well into the late 80s. Perhaps it was all sparked when he hooked up with Ivan Reitman, who had turned his attention to producing low-budget horror films. Reitman produced Fruet's first and most revered horror film, Death Weekend. Like Reitman's Cannibal Girls, Death Weekend made money when released on the American drive-in circuit by AIP. Of course AIP's savvy marketing department renamed it The House by the Lake and put it on a double bill with The Last House on the Left. From there, Fruet went on to make films such as Trapped, Funeral Home and Spasms. 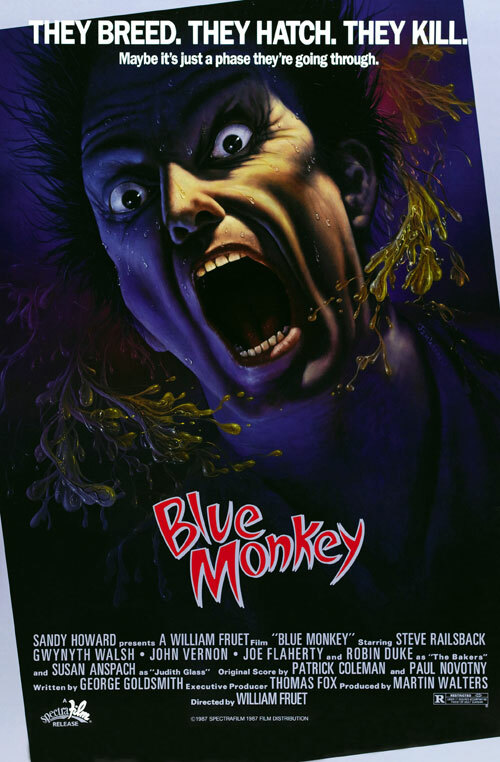 Blue Monkey was one of the last feature films he made. Blue Monkey goes straight for the jugular, wasting little time on such formalities as characterization or story. The movie has barely begun when Fred, a senior citizen visiting a local greenhouse, gets a bug bite on his hand when he touches a tropical plant. An ambulance whisks him off, but the bite has gotten pretty bad most of his finger is covered with a blue-grey lesion. When he gets to the hospital emergency room, the nurses are busy tending to the partner of a police detective named Bishop, who was shot. Attention quickly shifts over to Fred when a large worm-like creature crawls out of his mouth, just before he dies. 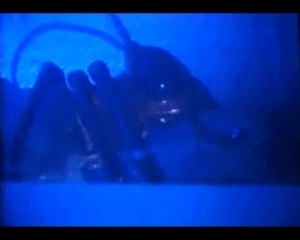 The worm is taken to the hospital lab to be studied by Rachel, one of the doctors in the ER. When she tries to dissect it, it starts oozing a green liquid and, unseen to the camera, a strange insect crawls out. She quickly traps it under a glass bowl, and decides to call a local entomologist to investigate the bug. By this time, we are told that four more people have died from the same symptoms as the old man. The hospital is quarantined just as Elliott (the entomologist), gets through the front doors. Disease is now the least of the hospital's problems, though. Four children, who all room together in the hospital, are out exploring the dark corners of the hospital when they spot the bug under the bowl. One of these children is played by a very young Sarah Polley, although this is a very small role with only a smattering of lines. Anyways, the precocious youngsters decide the bug looks hungry and feed it a neon blue chemical which is actually a "genetic growth promoter." Needless to say, the bug gets big at least 10 feet long. Before Elliott can find it, the bug escapes, kills some more people, and hides herself in the abandoned labyrinth of the basement. Then she cuts off the power supply. Well, sort of the lights flicker on and off for the rest of the film. Although this is kind of annoying, it is really a smart move on Fruet's part it nicely covers up any inadequate special effects since the bug is played by the old monster movie standby: the man in the rubber suit. Meanwhile, Elliott, Rachel and Bishop find the bug in the basement, giving birth! They react predictably. In 1950s science fiction and horror films, there are two different archetypal heroes. The first is the scientist who is fascinated by the academic ramifications of giant creatures and tries to stop the others from needlessly destroying it. The second hero is the military commander who wants to destroy the creature at all costs. To be simplistic, which type of hero a film had largely depended on what kind of message the film had, anti-nuclear or pro-nuclear. One of the notable aspects of Them! was that it featured both types of heroes, in conflict with each other. Blue Monkey also follows this route, with Detective Bishop trying to figure out how to destroy the bug and Elliott trying to preserve it for study. As is usually the case, Elliott loses. With the help of one of the kids who guide him through the basement corridors, Bishop loads himself up with butane tanks and eventually finds a room full of giant larvae feeding on the corpses of a couple of missing nurses. He torches the room (again, just as in Them! ), but fails to notice that the female is missing... she is busy attacking Elliott and Rachel! They manage to lure the bug into the hospital's new laser surgery room, and prepare for the final showdown. I kind of enjoyed Blue Monkey. The plot is swift and plausible, and the special effects are decent. Although you might assume the rubber bug suit is outdated, it actually works, and the worm coming out of Fred's mouth is also quite effectively done. Casting some believable actors also really helps out Blue Monkey. Unfortunately, Blue Monkey is not a shining example of Canadian film. This probably has a lot to do with the subject matter. While Canadian horror movies are certainly no stranger to giant killer creatures, this film is as close to an American 1950s sci-fi movie as I have seen in a "modern" Canadian film. Blue Monkey is mostly treated with camp humour and fun, never getting bogged down with too much science. And I think it does a great job, despite a distinct lack of blue monkeys.